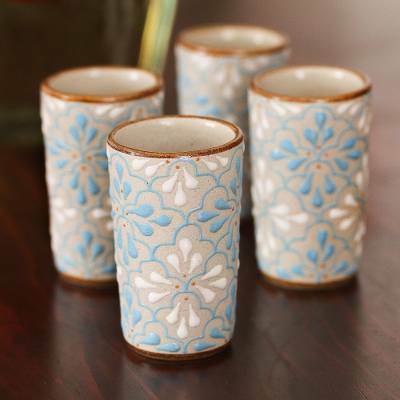 Blue and White Floral Motif Ceramic Tequila Cups (Set of 4), "Sky Dance"
Sip your favorite tequila or liqueur in style with this set of four ceramic cups. Handcrafted by Mexican artisan Topiltzin Castro, the exterior is hand painted in a floral motif in cerulean blue and warm white, accented with brown dots, atop the natural beige color of the unglazed ceramic background. Each (4): 7.4 cm H x 4.5 cm Diam. Each (4): 2.9" H x 1.8" Diam.